The contracts between the Big Three corporations and the United Auto Workers (UAW) expired at midnight September 14 but were extended as negotiations continued. The official union strategy had been to target General Motors as the lead. As union and company signed off on various issues, these were then taken to Chrysler and accepted, or modified. In the final hours, the UAW negotiating team huddled with GM. Negotiations between Ford and the UAW are last, and Ford has extended the contract indefinitely. The idea behind pattern bargaining is to target the company where the work force has the advantage. In this case Ford would have been the logical auto company to target. Autoworkers at Ford had rejected the 2009 concessionary reopening of the contract, thus maintaining the right to strike, a 20% cap on hiring workers at lower-tier wages and benefits and a small wage increase for second-tier workers. [Read more about the “no” vote here.] When the federal government worked out the bailout of GM and Chrysler, the Obama administration demanded that the work force suspend their right to strike over wages and benefits until 2015, eliminated the cap on lower-tier workers and eliminated dental and eye benefits for retirees. While Ford wanted “me too” concessions, autoworkers overwhelmingly rejected them. That’s exactly why the UAW leadership didn’t make Ford the bargaining target. The UAW represents 112,000 autoworkers at the Big Three. This includes 48,000 at GM, 23,000 at Chrysler and 41,000 at Ford. Approximately 4,500 are second-tier workers, but a number are temporaries who have been working for five years without any job security. Second-tier workers earn half wages and few benefits. “Traditional” workers have not had a raise in nine years and a portion of their cost-of-living adjustment (COLA) was diverted to health care costs and then frozen in 2009. Their holidays and break time was reduced, but they still have defined pensions and decent health care coverage. All work under draconian absentee policies and speed up. Much of the work considered “non-core” (that does not directly add value) has been outsourced. These jobs include janitorial work, performing clerical work in a tool room or organizing parts for the assembly line. From the beginning of the negotiations on the 2011 contract, the union chose to target the corporations where workers had suffered the greatest concessions. This backward strategy was considered necessary because the UAW International claims that in the 21st century unions must “join with the employers” to insure their adequate profitability. While UAW President Bob King has pointed out that over the course of the 2007-11 contracts autoworkers have given up somewhere between $7,000-30,000 in wages, working conditions and benefits, he has stated this was necessary. The Big Three are all profitable, paying off loans earlier than planned. Over the last two years, Ford has recorded $9.3 billion in profits. In 2010 the corporation handsomely rewarded CEO Alan Mulally and Chair of the Board Bill Ford Jr. with $26.5 million each and a total of $98.9 million in stock options. General Motors has also produced record profits, earning $2.5 billion for the second quarter of 2011 alone. GM’s CEO Dan Akerson is expected to take home $9 million this year. Even Chrysler, the smallest of the Big Three and now being reorganized by its new owner, Fiat, is profitable. 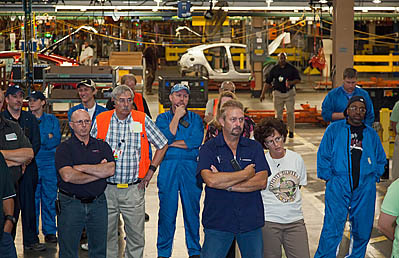 But the UAW International’s press releases and press statements do not demand an end to two-tier wages and benefits, the restoration of COLA, wage increases, or address the problems of speed up on the shop floor or proactive ideas such as opening closed plants to manufacture buses and cars for light rail. Negotiations indicate they are willing to settle for signing and profit-sharing bonuses that do nothing to overcome the inflation that has eroded autoworker wages over the last decade. Instead of demanding “equal pay for equal work,” they speak of raising the second-tier wages a couple of dollars. Equal Pay for Equal Work — eliminate tiers. Make all temporary workers permanent. No more plant closings — Reopen and convert shuttered plants to produce green jobs. Full disclosure and right to ratify contract changes — no rushed votes. This last demand is particularly important because the UAW only issues the “highlights” of the proposed contract before the informational meeting and vote. Later autoworkers discover they were considered to have “voted” to accept huge concessions. GM workers at Lake Orion discovered they did not even have the right to vote when the UAW negotiated turning the plant into a 100% two-tier workforce, immediately converting to 40% working at the lower wage. This was explained as being necessary for GM being able to produce a subcompact that had previously been produced overseas. They had presumably agreed to this when they ratified a vague Memorandum of Understanding that “an innovative agreement” would have to be put in place and authorized the shop committee to begin negotiations. Union officials maintain that was a blank check. Although the lowest 40% of the Lake Orion workforce was able to transfer to other GM plants and preserve their wages and benefits, many were forced to move hundreds of miles away, often leaving their families behind. But most interesting and unusual was James B. Treece’s “Why this year’s UAW-Detroit 3 talks don’t matter,” from the September 8, 2011 Automotive News. He pointed out that manufacturing costs account for roughly 15% of the vehicle’s total costs. That includes labor and capital equipment. What’s more important is management’s compensation and decisions. He notes that GM recently admitted it has been throwing away about a billion dollars a year, year after year, “because of poorly executed product-development programs.” Speed to the market is another factor. Instead of focusing on the UAW talks, he boldly suggests looking “at the Detroit 3’s product-development programs.” I’d also suggest looking at management’s inflated compensation packages. What autoworkers need is clear: good jobs, decent and safe working conditions, health care, the right to have a life outside work. What U. S. society needs are products built for the 21st century, which means an emphasis on developing non-fossil energy. Unfortunately the union negotiators are obsessed with the company’s profitability. This time around, will autoworkers stand up to their negotiators and say this is not adequate for our needs, or will autoworkers, knowing in their hearts the discussion is skewed, vote for a signing bonus because they believe that’s all they can get? Those of us who have campaigned to end two tier and to challenge the notion that profitability is society’s highest value are hoping that autoworkers disregard the propaganda and intimidation when they vote. The “highlights” of the tentative agreement, prepared by the UAW, and the “white” book that is the actual contract language, are available on the official UAW website. They are also available on rank-and-file autoworker websites, including http://www.autoworkercaravan.org/GM.html. Instead of bringing 2nd-tier workers up to the 1st tier, there is a $3.50 raise over the life of the contract, or less than $1 a year. So the gap between 1st and 2nd tier is still considerable. There is no cap on the number of 2nd-tier workers who can be hired and no provision that temporary workers, some of whom have been working at GM for five years, will be made permanent. Instead of restoring COLA and providing a 3-4% wage increase, the company and the union officials opted for a $5,000 signing bonus and additional bonuses based on “quality” and company profitability. For the 1st-tier worker the base pay in 2015 would remain what it is today. Given inflation this would probably be a 20% pay cut! No improvement on working conditions, but speed up, a continuation of a draconian absentee policy and more cutting of skilled trade work so that the production worker is responsible for more and more. As for retirees, 10% of profit sharing will be alloted to retiree health care, which is administered by VEBA. Will the eye and dental care that the bail-out agreement wiped out be reinstated? Only if the VEBA board of trustees so rules. If this contract is approved, retirees will lose their Christmas bonus (which is in lieu of any cost of living provision). Yet the media proclaim this is a win-win contract!